I remember when single serve coffee makers first came out. The coffee was terrible and I just couldn’t see the value in the machines when it took so little time to brew a pot of real coffee. Time passed and the coffee in those one-cup machines got better. Not only did the coffee get better, but the technology behind it improved to the point where I was very impressed by how much a Keurig machine impressed me the first time I used one. This special edition brewer is the first Keurig I’ve had in my kitchen, and it is earning its spot on the countertop beside some of my other coffee makers. 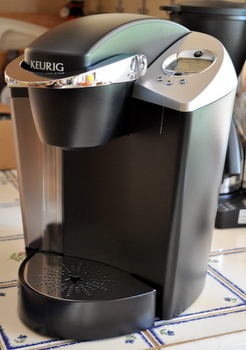 It is very fast, reliable and is especially handy when I don’t want a whole pot of coffee. The Special Edition is special for a couple of reasons, many of which I outlined in a previous review on Baking Bites. The machine has a large water reservoir and brews coffee (or tea, actually) in three sizes: 6oz, 8oz, and 10oz. I tend to stick to 8oz for most coffees. All of the Keurigs have similar coffee brewing abilities and can brew cup after cup rapidly as long as the basins are filled and will perform consistently over time. With the special edition, you are able to program water temperature and choose an Auto On/Off. The machine also has chrome accents and blue back-lit screen that Keurig says – and I would admit that I agree when I compare it with more basic models – gives the machine an “upscale” appearance. This model isn’t that much more expensive than other models, so it’s all a matter of personal preference when picking one out and I have had no complaints about the basic models (although I do like the chrome on this one) I’ve used in terms of basic functionality.